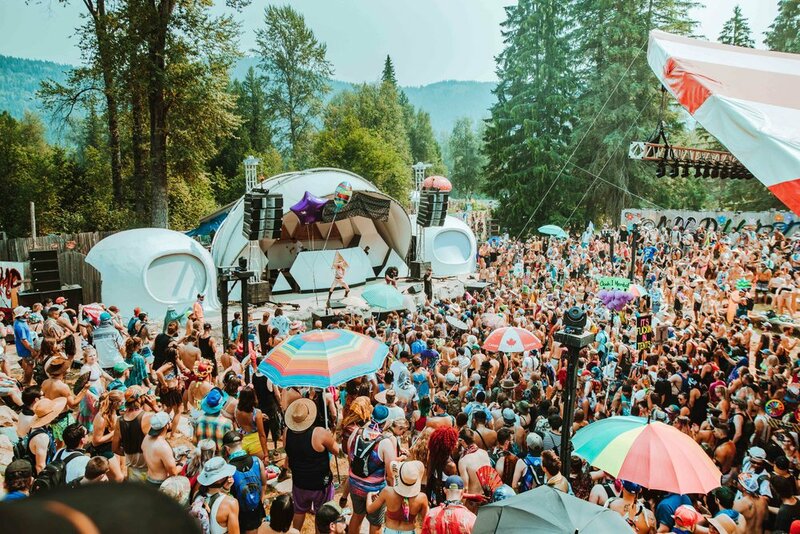 With 21 years at the same location, seven stages of music, event direction handled by the landowner's family, no corporate sponsorship, and now the purchase of a mass spectrometer, Shambhala Music Festival at Salmo River Ranch, British Columbia, Canada is perhaps the most successful music festival in North America. Its powerful grasp over the breadth of dance music culture has enabled it to create a diverse following with a high potential for cross-pollination of sonic ideals and outlet discovery. To say I was shocked and awed by what I saw upon my first attendance to this festival would be a sad understatement of the kindness, generosity, and care that I experienced. Shambhala Music Festival and its attendees are quite attentive to the general experience of the festival, and quite in touch with one another. 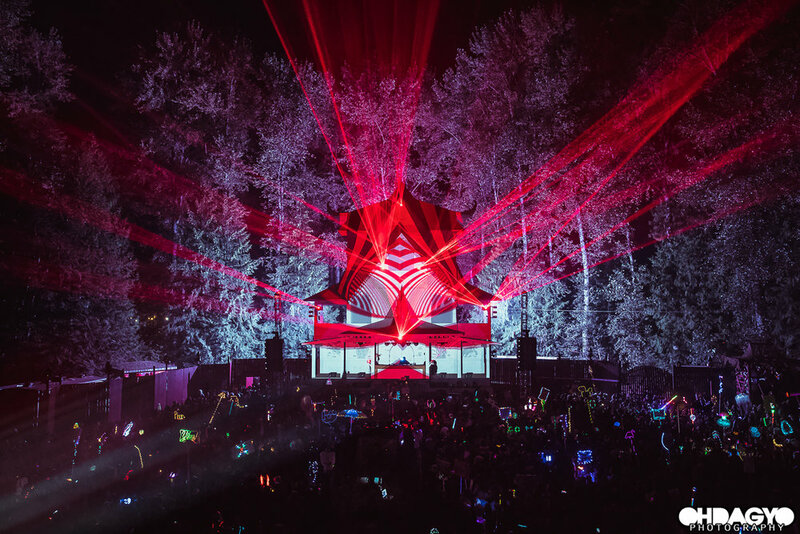 Shambhala's two-decade rise has been marked by slow and careful growth, and each new increase in size is met with vital infrastructural improvements. The increase to some 20,000 attendees in recent years caused the two outlets to the Salmo river (the Living Room stage and Muscle Beach) to become overcrowded. Increasingly, people began walking across the footbridge at the Living Room into the neighbor's property to make use of the opposite bank. As a result, that bridge has been removed, and a new path eased out along the riverside with many outlets for squadly activities. The dance floors are now watered by the stage workers. The Village is especially noteworthy for incorporating a large waterfall installation. When last year's nearby wildfire caused an emergency exodus that demonstrated the need for additional egress in stressful situations, the landowners installed a new bridge made of steel to split the herd near the exit. Major moves like this demonstrate the dedication the Salmo River Ranch owners have for the safety and wellbeing of their attendees. Shambhala has also been a vital germinating force for the growth of original sounds. The festival hosts yearly performances from now-confirmed Big Deal acts like Stickybuds and Stylust (formerly Stylust Beats), and has helped raise underground success stories like Goopsteppa and CharlestheFirst (whose Big Deal-ness appears imminent). Then there’s the blooming of burgeoning dubstep label Chord Marauders, for whom Shambhala was the biggest show they've ever played. For Jafu, Shambhala three years prior was his first time ever playing a show that wasn't “something small, for friends, to get myself comfortable playing music for people.” As a rare-to-Shambhala label showcase act, the collective received more attention than ever before, even spotlighting their first signed artist FLO. 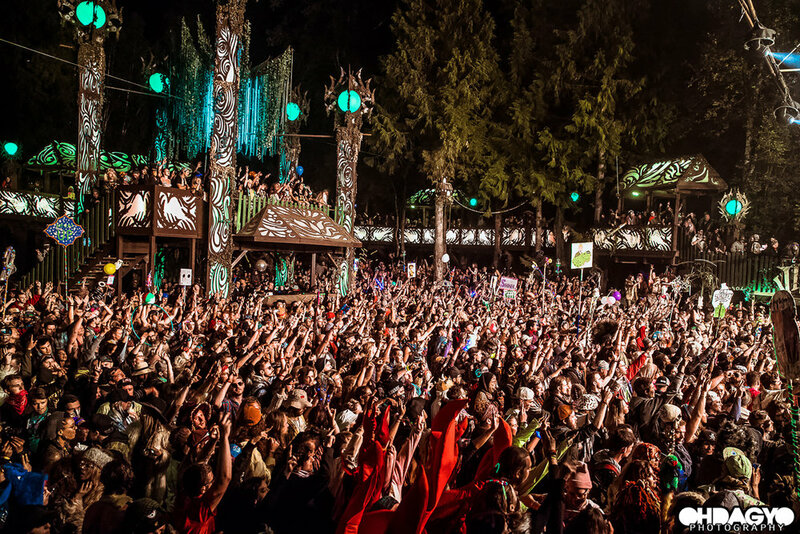 Between the funky basslines at the Fractal Forest, the hard-hitting powercore of the Village, and the soothing atmosphere of the Grove, there could exist a serviceable underground dance music festival. Between the live acts of the Living Room, the intimacy of the Amphitheater, and the “Main Stage” appeal of the Pagoda, there could exist another strong, more mainstream music festival. That the organizers chose to combine all of these thematic feelings and managed to keep attendance low enough to support a comfortable amount of breathing room at each stage is nothing short of miraculous. The result of this miracle is felt in the joy of constantly finding new music and new areas of the culture to discover, and experiencing the curiosity from others towards the rituals and artifacts of one’s own section of dance culture. The myriad of people passing by and sharing themselves with one another is the hallmark of any successful festival. 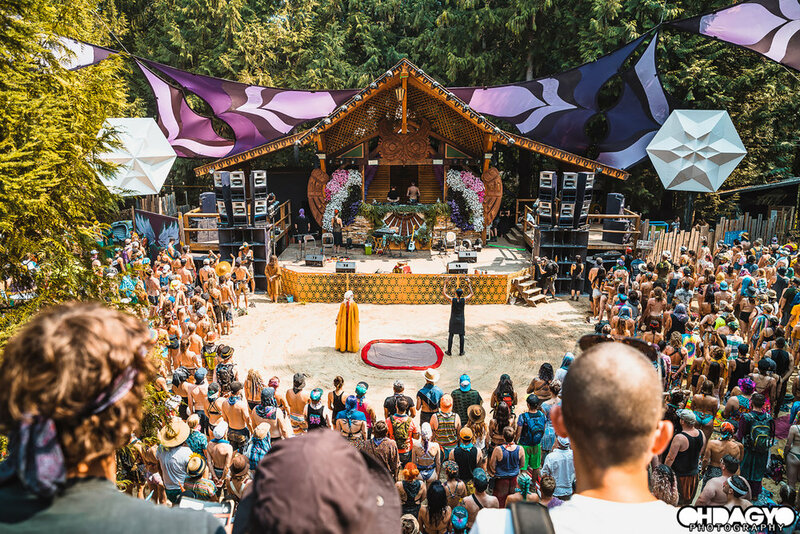 Shambhala takes it further by creating comprehensible territory for the growth of distinct, microcosmic “scenes” in greater numbers than I've ever seen, both in terms of attendance and in number of stages. The stage-to-attendee ratio is easily twice as high as most festivals, and the resulting experience is immersive and enrapturing. The talent curation at each individual stage is extremely attentive to detail. When Joker couldn't make it to his set at the AMP stage, the stage staff rustled up a set from the intentionally rare Shadow People, aka TRUTH and Youngsta. TRUTH was performing that weekend without Youngsta, who wasn’t booked for Shambhala at all but was at the Ranch anyway since the two were on tour together (and Youngsta was playing a Shambhala pre-party). They were playing only a handful of Shadow People festival dates in North America, so the organizers found not only a replacement, but a spur-of-the-moment set that their attendees likely couldn't have caught otherwise. Similarly unique, while most of the dubstep of the Grove was beautiful, somber, and deliciously spare, there was also a rare grime set from D-Double-E and a set from Joe Nice; two grizzled veterans who'd become kings in their own right, playing alongside the next generation. Such was the power of Shambhala that the entire motion flowed smoothly from one act to the next, never causing any disruption in the crowd. Perhaps the most impactful aspect of Shambhala was how distinctly I could observe my past, present, and future as a listener of electronic music. I caught the entirety of Koan Sound, remembering how next-level their sound design and beat structure appeared before I ever learned to describe such things in words. Performing prior to the boys from Bristol was Adventure Club, who I had last seen in those same baby raver days. There was Dirtwire, who I'd seen grow over the last three years from a small two-person project to a three-person band with matching outfits and a developed sonic aesthetic. Then there was Kursa, who pushed the boundaries of what I considered danceable. Each laid out how I, as a listener, have developed my tastes, how I'd been spending my time and energy since I went to my first show, and what I wanted to see more of in the future. Shambhala’s unique spread is truly appropriate for anyone at any point in their journey through bass music. The infrastructure of Shambhala grows and improves every year. Even if you feel that only one stage speaks to your booking tastes, there will undoubtedly be acts you enjoy on other stages. I found myself having the time of my life at the Fractal Forest most mornings despite not once catching an act that I recognized or that was recommended to me (damn me for missing Skratch Bastid), simply because the stage design was so incredible. Shambhala exists to provide its attendees with the smoothest experience possible, from the drug testing to the Shambhassadors - Info Hub volunteers who roam the festival spreading information, sharing their experiences, and generally raising the vibe (as far as I know the only festival job that encourages smoking cannabis with the attendees). Without a doubt, there is something for everyone at Shambhala, and a thriving culture that wants to show you every facet of its being besides. Well, no psytrance, although that's a whole other article altogether!